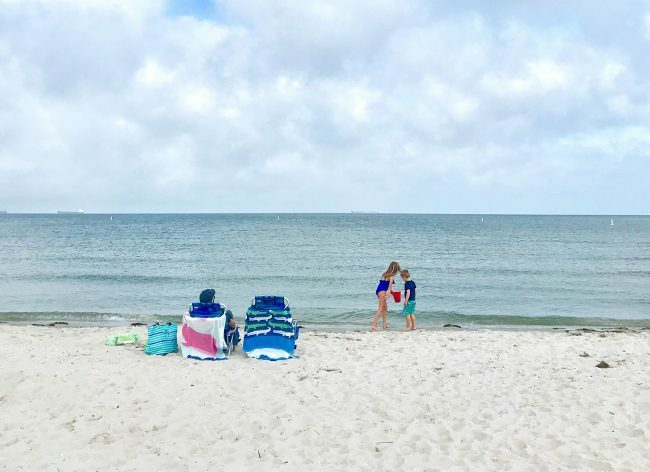 I know it’s odd to be posting a beach-centric travel guide after summer’s over, but Sherry has been fielding so many questions lately about what to do in Cape Charles that we wanted all the answers in one place. Now people can just drop in on this post for all the details. And boy, are there details (have you met me? If not, hi, I’m John “Thorough” Petersik). So if you’re thinking of making a visit to our favorite little beach town (which was also recently voted #3 Happiest Seaside Town by Coastal Living! ), or are just curious about why we chose this place to renovate two vacation homes, this post is for you! 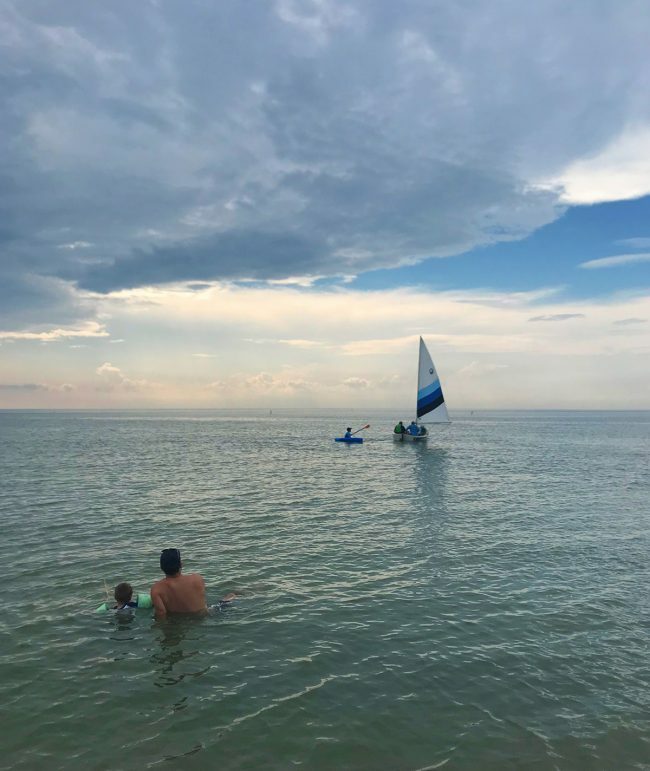 We’re covering some fun activities for the family, our go-to meal places, and other reasons we think Cape Charles is the perfect place to unwind and soak up some pretty memorable sunsets. 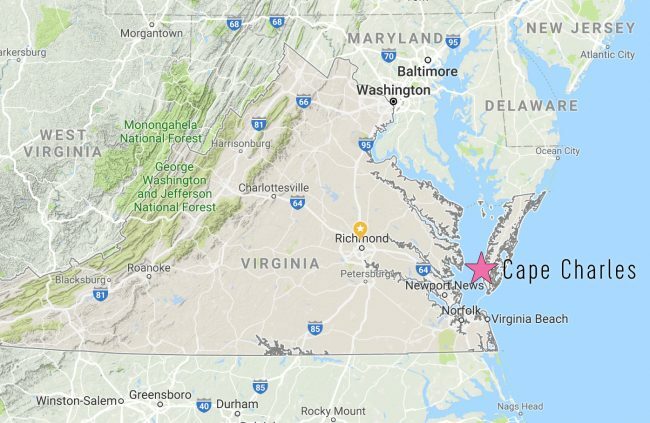 Cape Charles is located near the southern tip of Virginia’s Eastern Shore right on the Chesapeake Bay. The Eastern Shore is a small, rural portion of the state that’s separated from mainland Virginia by the Chesapeake Bay. 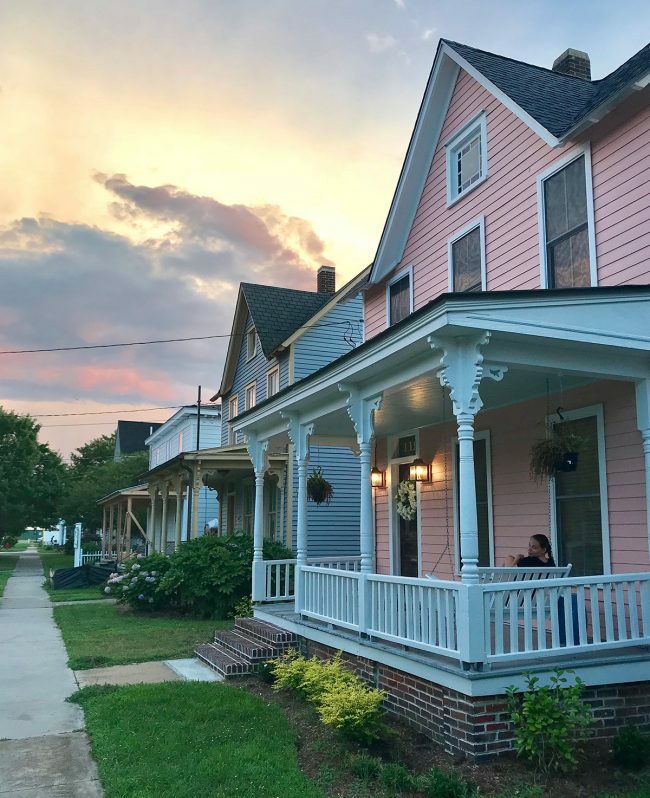 Cape Charles is a small town (the historic area is roughly a six block by six block square) that sits on the peninsula’s western coast… meaning you can sit on the beach in Cape Charles and watch the sunset right over the water. Highly recommend that. 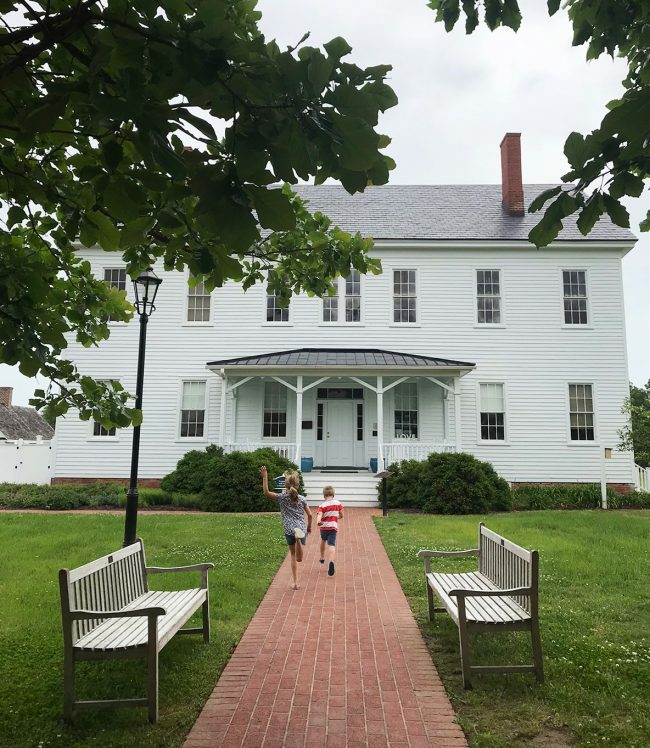 It’s about a 2.5-hour drive from our home in Richmond, which culminates in crossing the Chesapeake Bay Bridge-Tunnel, a 23-mile long stretch of several bridges and two tunnels that offers quite the impressive welcome to the area (gorgeous water views). It’s also accessible from the north via a quiet drive through Maryland (it’s about 4 hours from Washington DC). Or, if you need to fly, the Norfolk International Airport is just across the bridge-tunnel – about 45 minutes away. The town is relatively unknown and only in the last 5-10 years has it been experiencing an upswing as people have discovered it as a low-key alternative to your typical beach town, which means lots of homes are getting fixed up, new restaurants and shops are opening up, etc. It has been really amazing to watch this town spring back to life and be revitalized, beautified, and enjoyed. 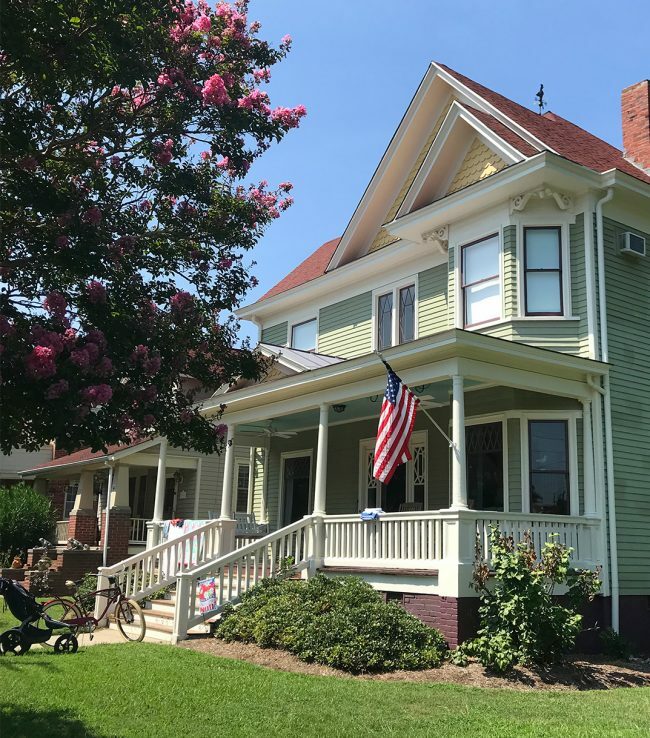 Especially because the historic area is home to hundreds of beautiful 100+ year old houses, many of which needed a lot of love, and many of which have been lovingly restored. And our two are tucked right into the middle of it all. First lets talk about the beach, because it’s what sold us on Cape Charles (and it’s usually our go-to place every time we visit). It’s uncrowded, low-key, and easy to get to. Since it’s on the Chesapeake Bay, not the Atlantic Ocean, the water is calm and shallow. At high tide you can walk out several dozen yards and still be barely waist deep in most parts (I’m sitting in the photo below, so the water is only about 18″ deep there) and at low-tide you can park your beach chair right in the water to keep your feet cool. 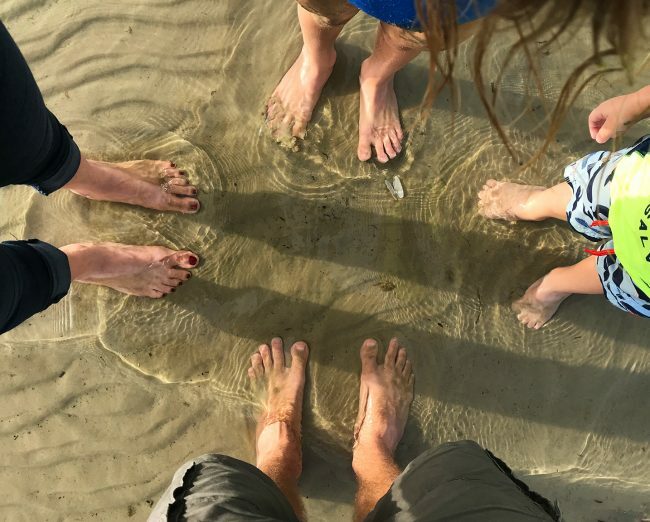 It attracts lots of families like ours because kids can play for hours in the water without us parents having to fear the break of a big wave or the pull of a sudden riptide. 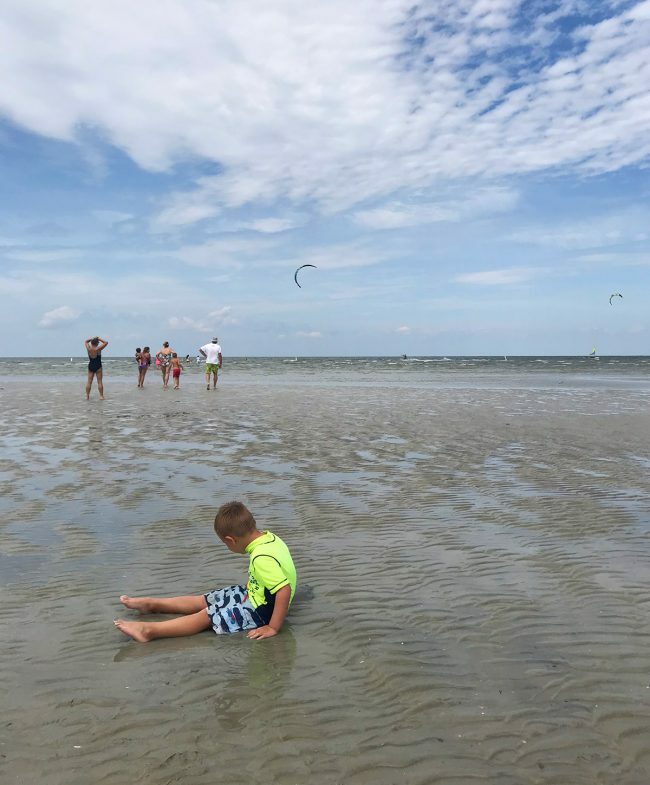 Our kids have spent HOURS splashing around, riding on floats, or even hunting for hermit crabs (yup, you can find them walking around on the sand in low tide). Yup, these are all little hermit crabs we collected one evening at low tide. 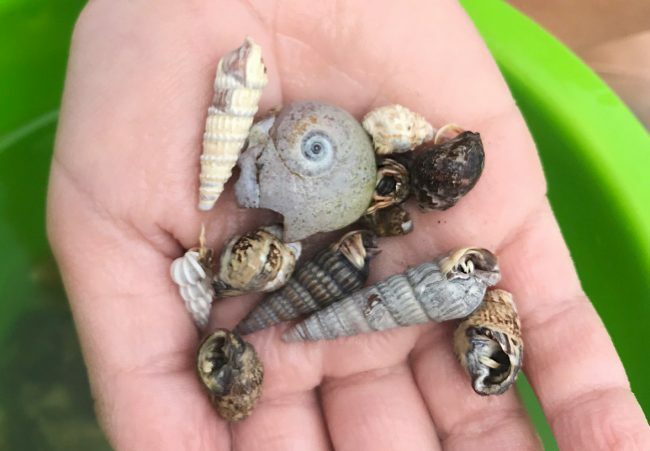 They’re such a novel thing to discover with kids, and they can put them in a bucket to watch them swim (and even witness them switching shells if you’re lucky!) and then toss them back in the water before heading out. 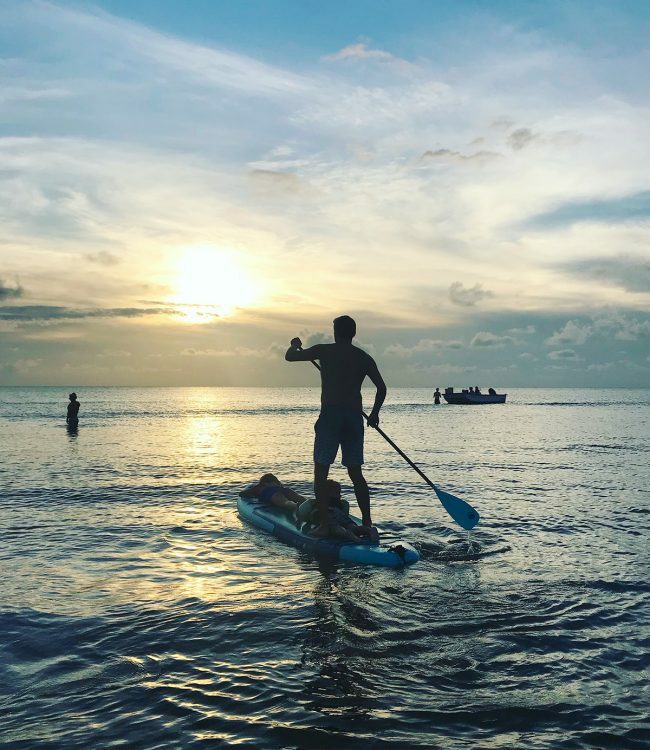 I you crave a bit more activity when you go to the beach, Cape Charles Beach is great for kayaking, stand up paddle boarding, fishing, jet skiing, or boating. On a windy day you’ll even see kite boarders. If you don’t have your own, there are a couple of rental places, like SouthEast Expeditions and the Oyster Farm at Kings Creek. The other great thing is that PARKING IS FREE AND PLENTIFUL! You can park right along the beachfront street, Bay Avenue, with no problem – even on most summer weekends. No circling the block to find a spot or having to pay for metered parking. We LOVE that fact. There are also public restrooms with showers behind them near the big “LOVE” sign at the corner of Mason Ave & Bay Ave, and on summer weekends there’s often a delicious taco truck and an Italian Ice stand parked nearby. For such a compact town, there’s a surprising variety of options for your stay. We should first mention that there are vacation rentals through sites like HomeAway and Airbnb, which can be great for long stays, like a full week. The one shown below was even featured on HGTV! 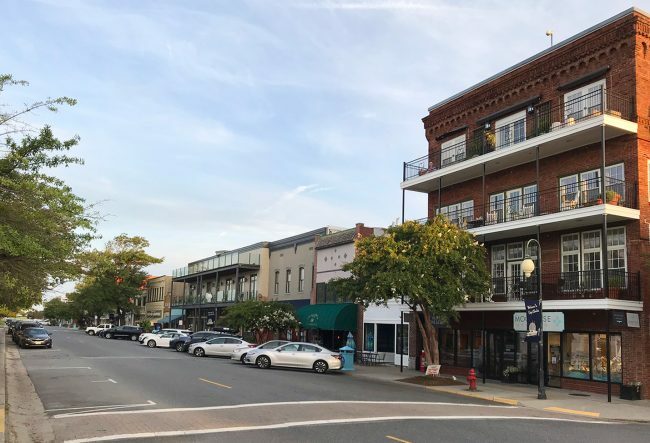 Just be mindful that those sites often return results outside of the historic district (but being inside the historic district is where you’ll get the most proximity to the beach, shops, and restaurants). So just double check that it’s actually in Historic Cape Charles if you plan to walk to shops, the park, the beach, restaurants, etc. 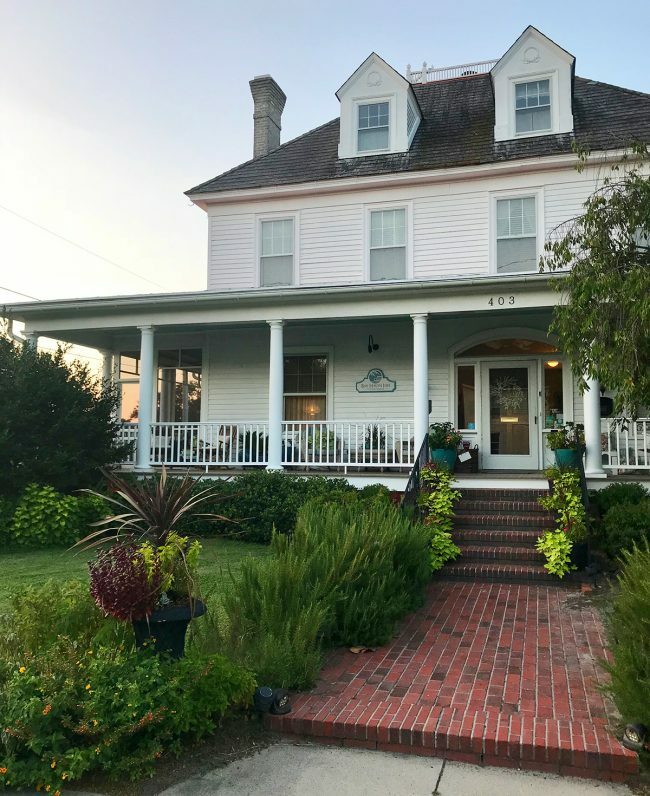 There are also a lot of bed & breakfasts in Cape Charles, like the Bay Haven Inn (below), Cape Charles House, and Alyssa House to name a few. We had the chance to visit several during a holiday open house event and they’re all beautiful with great historic details. Another great option, especially for shorter stays, are hotels. The two in town are both AWESOME, but very different. 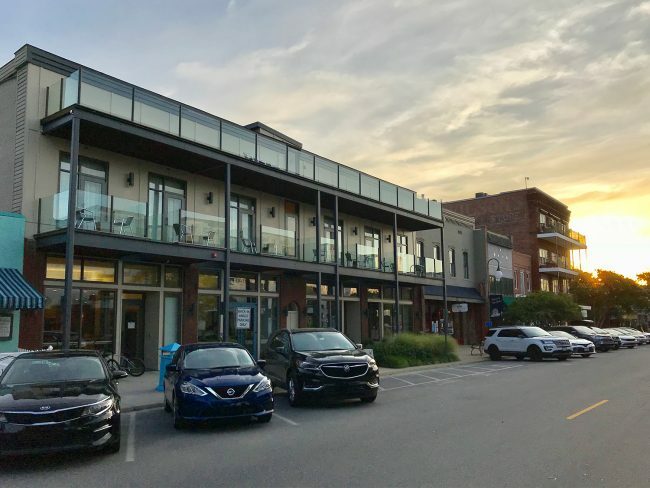 Hotel Cape Charles is a modern “zen-like” hotel with loft style rooms (think: exposed brick, reclaimed wood, and those glass balconies that you see in the photo below). They also have fun perks like golf carts and bikes that are available to guests. 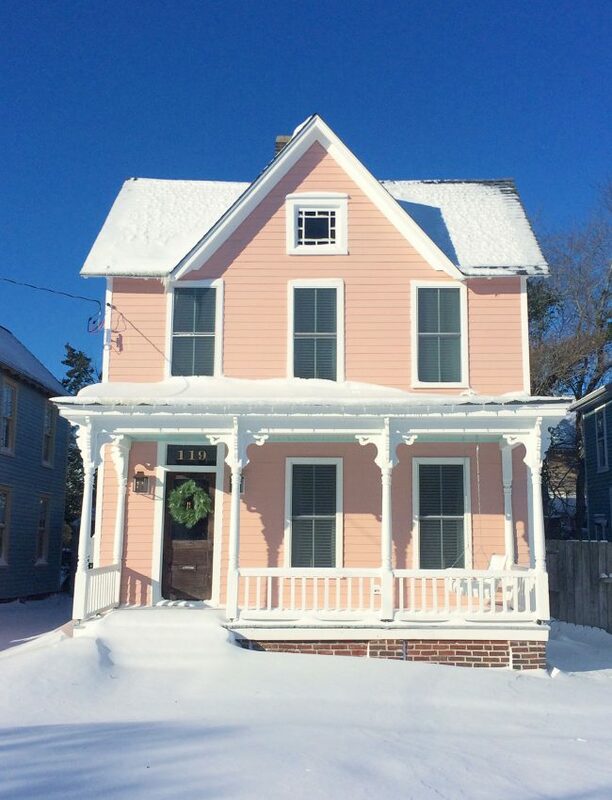 We stayed there one night while tiling the pink house and loved it! 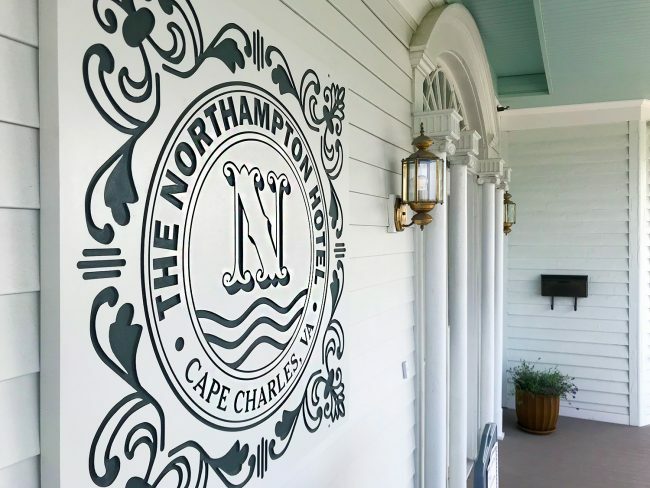 By contrast, the newly opened/restored Northampton Hotel has water views (it’s closer to the beach) and a more historic/Southern feel (like a giant front porch with a haint blue ceiling where you can have coffee and breakfast, with lots of traditional and ornate details like wallpaper, detailed molding, etc). There are also some more bargain-priced hotels and motels just outside of Cape Charles if you just need a place to plop your head at night. Lastly, Kiptopeke State Park offers campsites and a few cabins (even a yurt!) nearby – as does Cherrystone Campground. Both are also waterfront, so you can enjoy the beach there without coming into town. But we’d definitely recommend venturing into Historic Cape Charles just to check out a few of the places we’re about to talk about below. The restaurant scene in Cape Charles is, well, not quite a scene yet. But that doesn’t meant there aren’t plenty of good meals to stuff in your face hole. 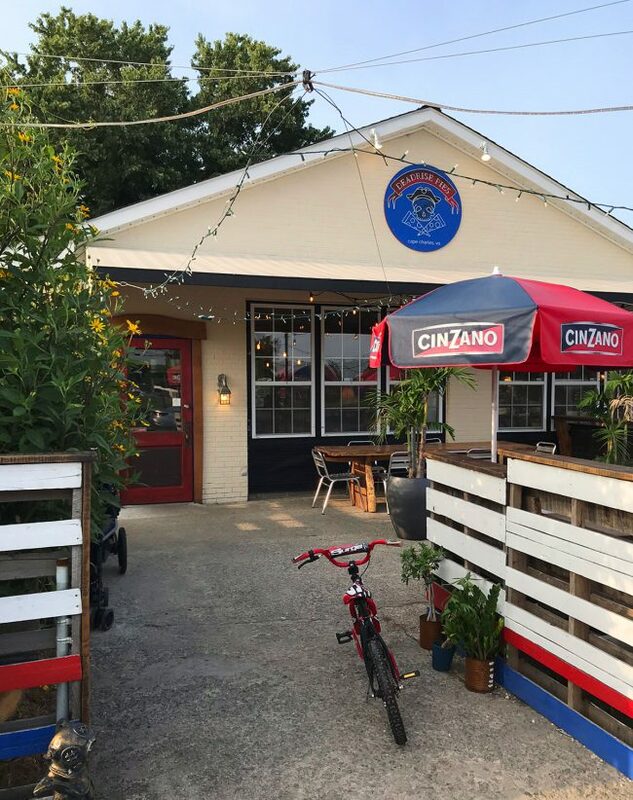 Most of the commercial action in Cape Charles is concentrated on Mason Avenue, the town’s de facto “main street.” But our favorite dining spot is actually a short distance away, called Shanty. It’s a casual seafood place, complete with an oyster shell parking lot and an old boat out front full of plants. It has a ton of fresh fish tuna, shrimp, and oysters (for either lunch or dinner) as well as great options for non-seafood lovers and children as well (chicken fingers, quesadillas, burgers, etc). It’s on the water so you can catch great sunsets, and in the summertime they often have live music on weekends. It’s popular with locals and visitors, so if you want to avoid a long wait it helps to come early (before 5:30 is the best time to aim for), or get a reservation (typically you have to call the day before to score one). Or just put your name on the list and they’ll text your phone when your table is ready – so you can walk around outside or even play corn hole out back and watch the boats in the marina while you wait. Another favorite of ours is Deadrise Pies, which is a pizza/Italian place operated by the Shanty folks. It’s also super kid-friendly, has great outdoor seating, and is also really nice when you need some easy carryout. We often get pizza and take it to eat on the beach at sunset! Some argue that Gerry’s Ristorante outside of town has better pizza (we like ’em both) but Deadrise wins for location and ambiance. A newer favorite of ours is Cape Charles Brewing Company, which serves food and has great outdoor seating. 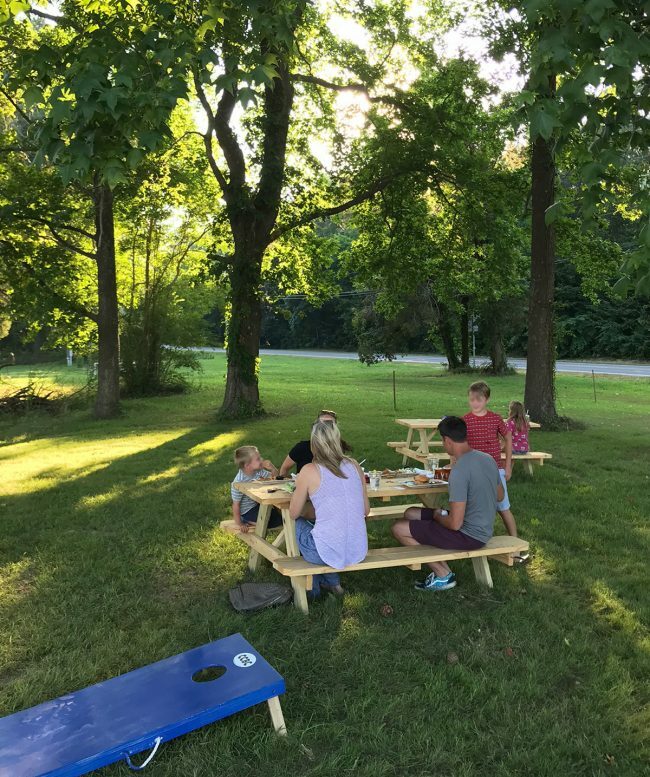 We ate at shaded picnic tables while the kids played corn hole and ladder golf nearby and it was perfect! 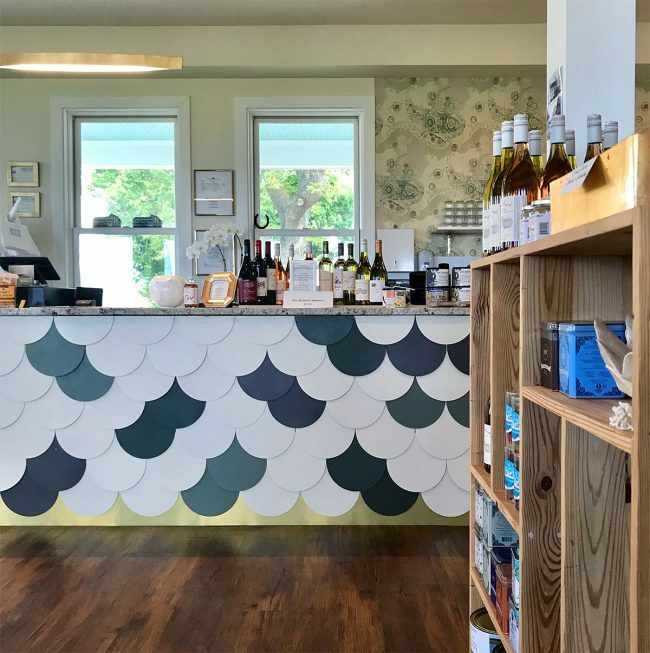 Kelly’s Gingernut Pub is also a good option for kids, and people recommend Hook-U Up and The Oyster Farm for nicer adult date-night dining excursions, but since we’ve always got kids with us we haven’t tried them yet. 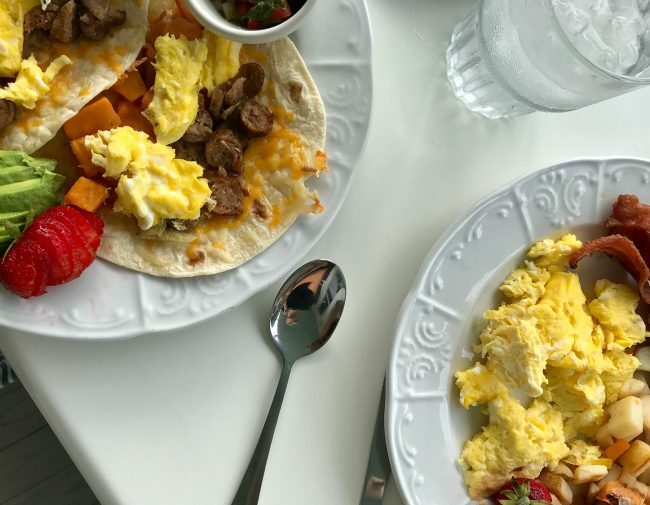 Our go-to spots for breakfast are the Cape Charles Coffee House and the cafe at The Northampton Hotel (above), or you can eat more casually at Rayfield’s soda fountain. We like to grab lunches at Gourmet Alley or Tim’s Place too. There are also other staples outside of town (like fast food and carryout Chinese) and in other exciting news: it looks like we’re getting a couple of new bakeries soon! A satisfying meal is all well and good, but one of our favorite parts about Cape Charles (and, well, life in general) is DESSERT. And if you’re more into the “grown-up desserts” (aka, drinks) we’ll cover that here too. Reigning dessert champ in Cape Charles is Brown Dog Ice Cream. 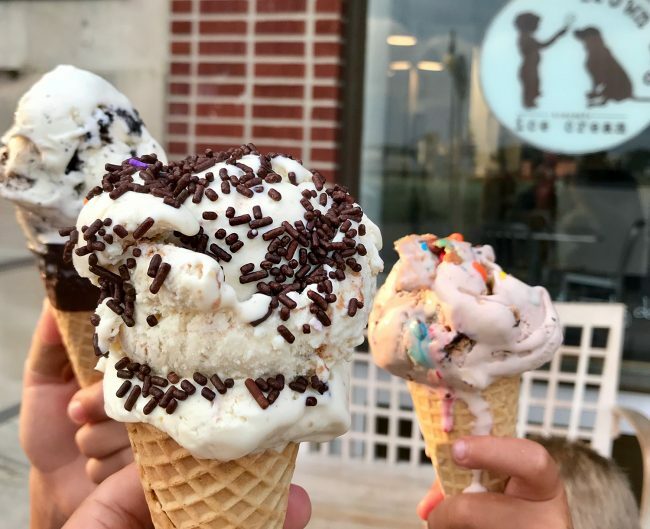 This charming ice cream parlor with an ever-rotating menu of flavors was named among the “Top 10 Best Ice Creams in America” by TripAdvisor. They’ve got plenty of classic flavors, but I always love their experimental ones with names like Lemon Curd Coconut Hot Milk Cake and Peach Raspberry Goat Cheese Crumble (the one below with sprinkles is Caramelized Fig with Mascarpone & Coco-Ginger Dust). And you can get any flavor as a milkshake, malt, float, or an ice cream sandwich too. 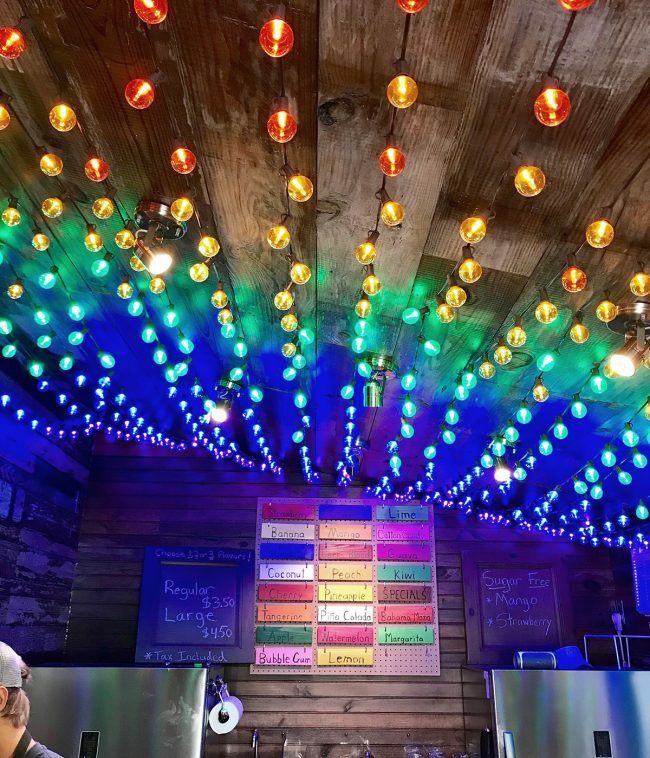 The new kid in town is Peach Beach Shave Ice Shack, which was started out of someone’s shed. They shipped in an authentic Hawaiian shave ice machine to make finely shaved treats that are distinctly better than your typical snow cone. Plus, the interior is super charming! They’re only open in the summer season for the most part, but they’re awesome on a hot day. A less known, but also less expensive dessert option is CC Kool Eatz, which is hidden in a residential area on the north side of the historic downtown district (at the corner of Jefferson & Strawberry). They have some great soft serve with little tables to enjoy it outside. 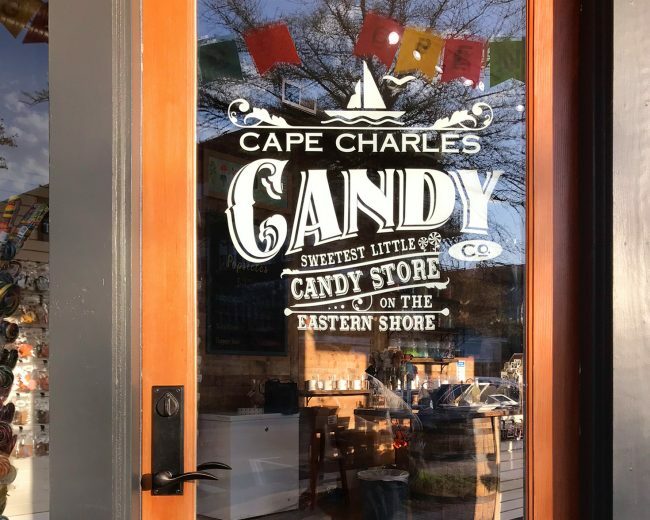 We also got a new candy shop this year, the Cape Charles Candy Co, which was opened by the family who was featured in the episode of HGTV’s Beachfront Bargain hunt that our house photobombed! As for places to grab an adult beverage, in 2018 Cape Charles got a brewery, a distillery, and a cidery. Sherry likes to call it the trifecta of hipster spots to grab a drink – and they each have some pretty great atmosphere and that craft-brew feeling. 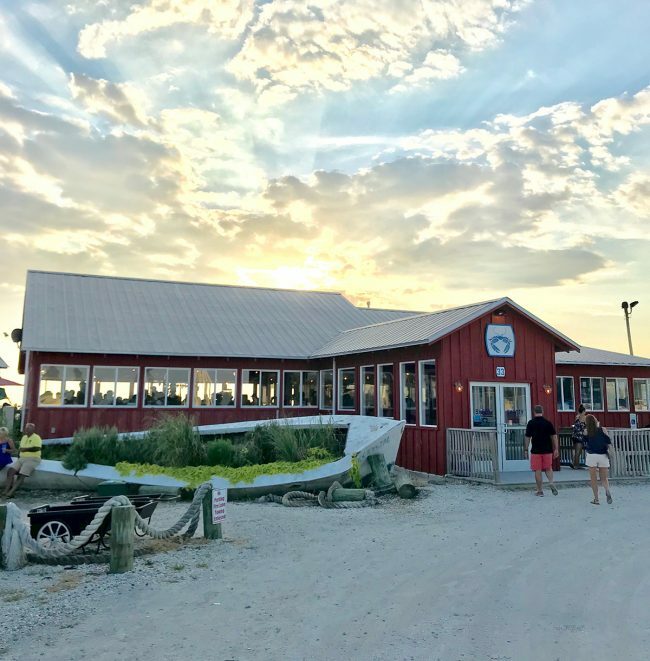 As I mentioned above in the food section, the Cape Charles Brewing Company serves meals for the whole family and has lots of outdoor space as well as craft beer (flights, samplers, etc). We haven’t been to Buskey Cider on the Bay yet (an offshoot of a Richmond cidery!) but it has lots of board games and outdoor games (think oversized Jenga) on their outdoor patio. 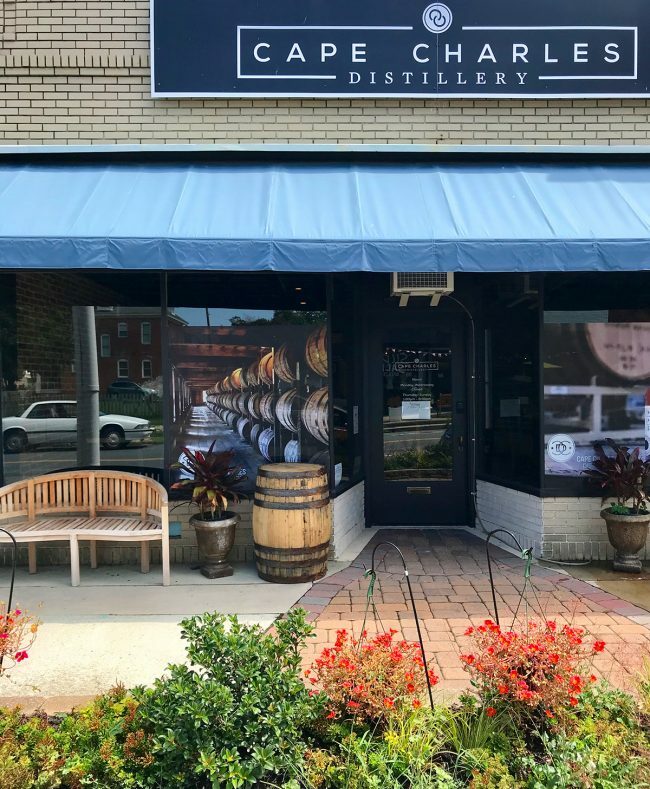 The Cape Charles Distillery is a decidedly more grown up space that sells upscale whiskeys, bourbons, moonshine, and vodka. And if wine is your thing, Chatham Vineyards is just up the road. They even offer a “Paddle Your Glass Off” tour where you kayak to the winery on a guided tour and then get to sample some wines when you get there. You’ve hit the beach, stuffed your belly, and enjoyed the sunset. Now what? 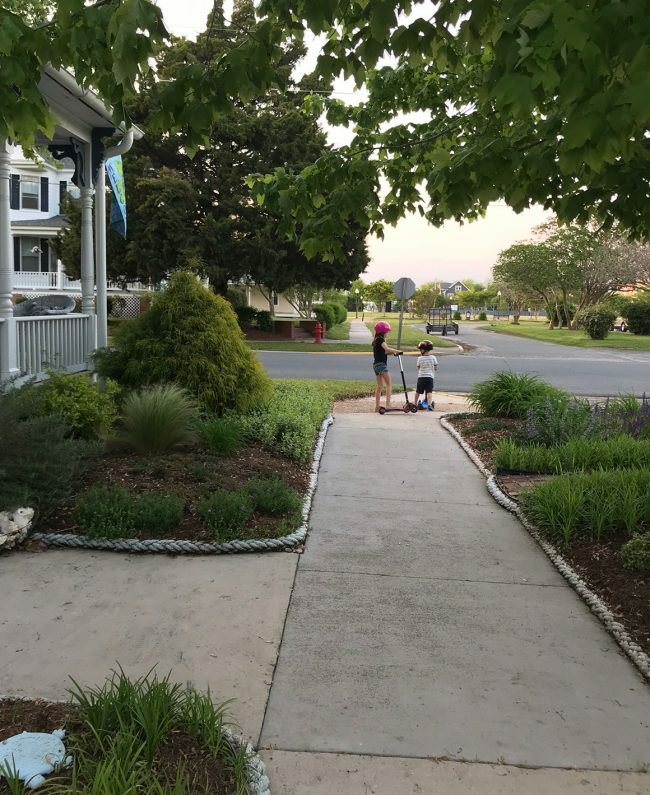 Cape Charles is certainly a quieter beach town than those you may think of with a boardwalk, mini golf, arcades, and outlet malls (although there is one of those beaches right across the bridge). So our “to do” list here usually involves a lot of relaxing, walking, and exploring. 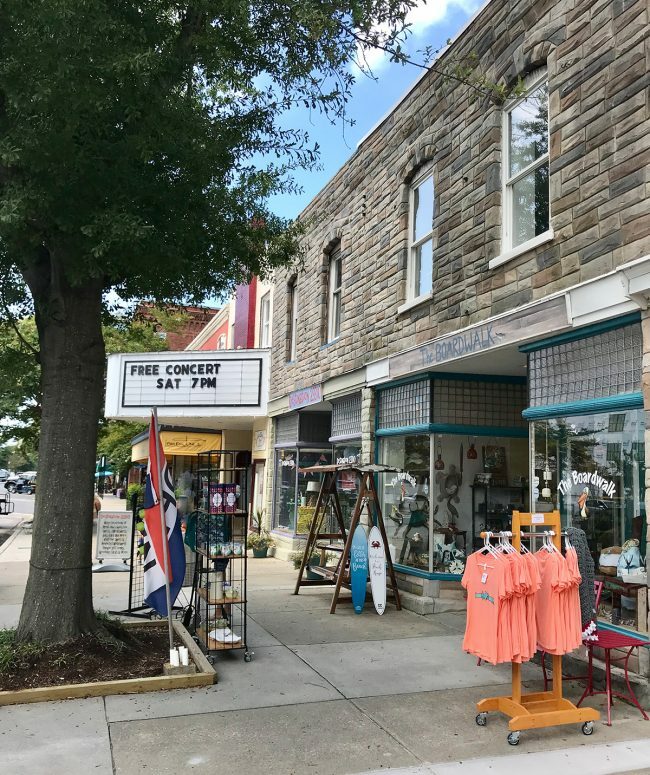 The town’s main street, Mason Avenue, has lots of charming shops – including beach souvenirs, decor, clothing, jewelry, vintage furniture, art, wine, and more. Some of our favorites for browsing are Chuckletown Productions, The Boardwalk, Destination 23310, and the gift shop at The Northampton Hotel (seen below). 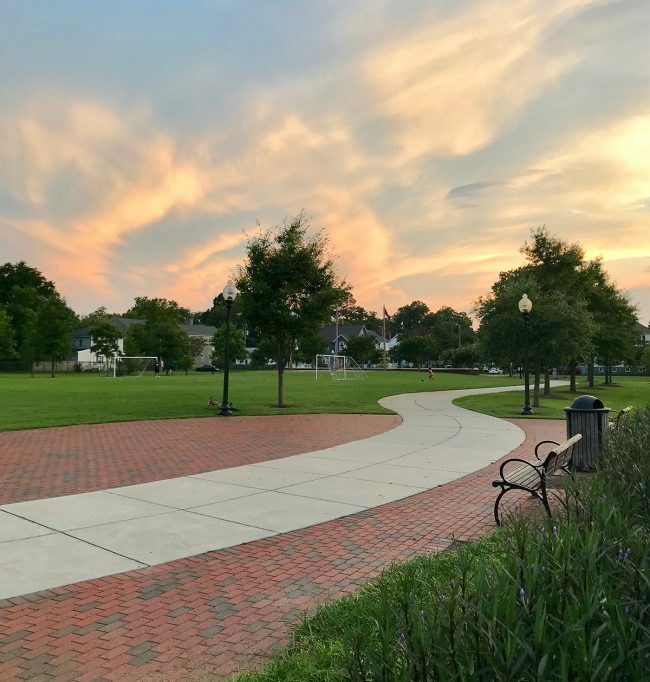 There’s also a large park that’s centrally located in the historic district (yup, it’s actually called Central Park – just like our old favorite in NYC). It has a large public field for tossing or kicking a ball around, a walking path, a playground, and tennis courts. We use it most for the playground and every Saturday in the summer they host live music in the gazebo and people bring lawn chairs and food/drinks to enjoy on the field while they watch the musicians play. We usually end up doing a lot of walking around the downtown area to check out all of the houses (especially if we remember to bring the kids’ scooters). But if you want a more natural hiking spot, the Cape Charles Natural Area Preserve is a shaded boardwalk through the woods that’s just a short drive from town (I run there in the mornings from our beach house). 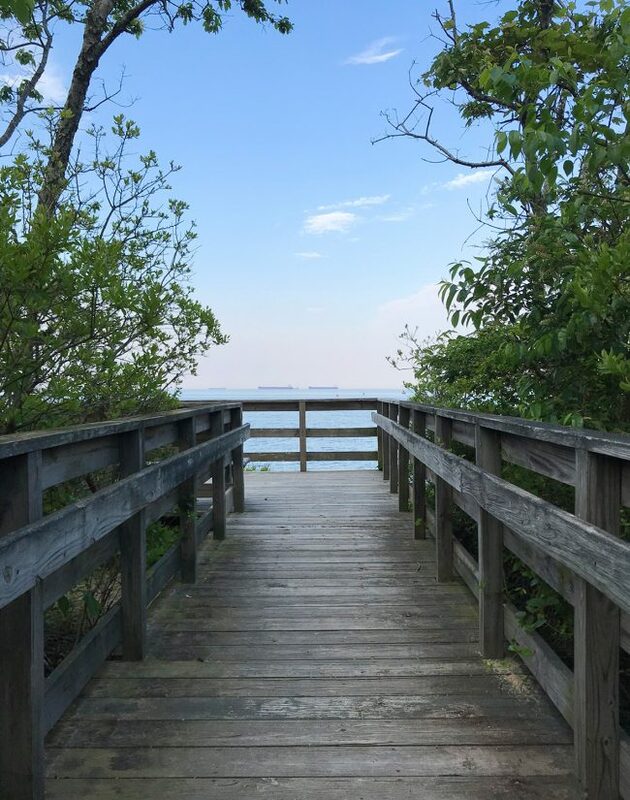 Further out of town is the Southern Tip Hike & Bike Trail which is a wide 5-mile paved trail that terminates into a Nature Center that we haven’t visited yet, but we hear it’s good for kids (it and Kiptopeke State Park have more trails too). 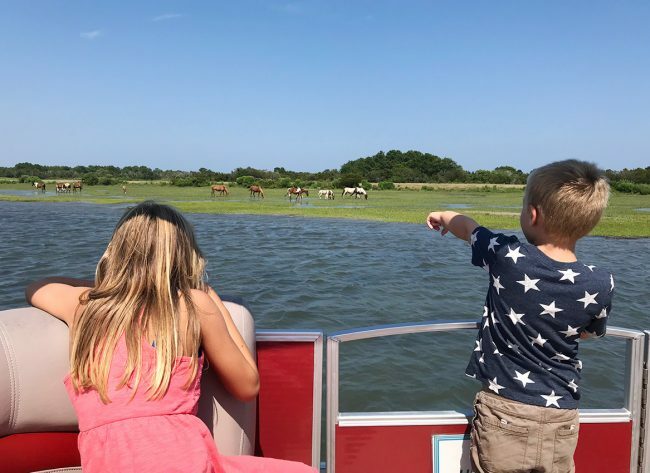 …and we took a day trip about an hour north to Chincoteague Island this summer to see the wild ponies. That was INCREDIBLE. We took this tour, but we hear there are a bunch that are good. Cape Charles is also great for fishing, crabbing, boating, and golfing – but none of those are pastimes of ours so we’re not really qualified to advise on them. But there’s a free fishing pier in town and just outside the historic district are two signature golf courses (one Nicklaus, one Palmer – that means something right???). Someone asked recently if there’s anything to do in Cape Charles in the off-season. The answer is “Yes!” but also with a little bit of “no.” While the town is truly at its best in the summer months, it is still fun to visit in the Spring, Fall, and Holiday season too. Heck, we’ve had beach days – including going in the water! – as early as April and as late as November! There are lots of activities and events in the off-season, so it’s probably best to plan around one of those. We’ve come for the garden tours in April, a trunk-or-treat event in October, and their holiday main street celebrations in December (complete with Santa and free movies at the historic theater – last year they played Home Alone and it was awesome). 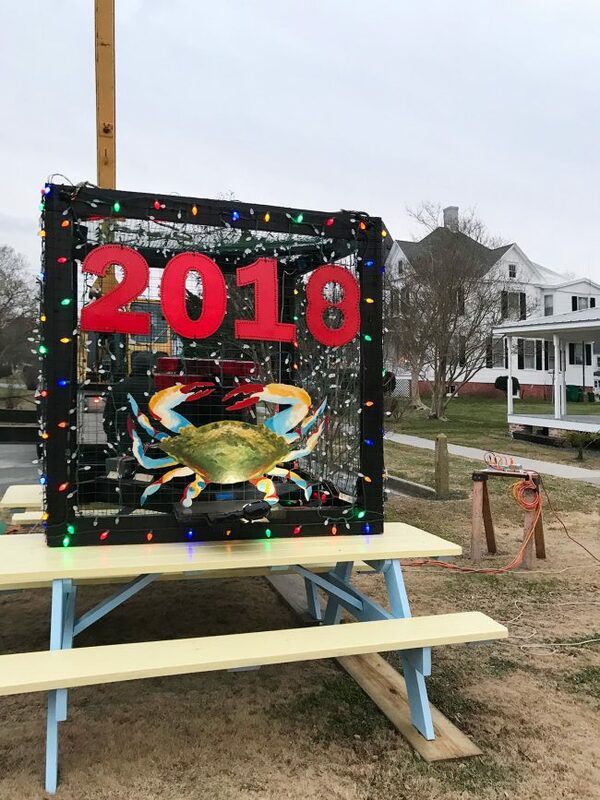 We also came for New Year’s Eve this year, where they dropped a decorated crab pot to ring in 2018! Doesn’t get much more small-town-quirky than that. The only thing to note is that business hours get a bit funky in the off-season with shops and restaurants being closed more often (or even completely), so it’s always a good idea to call before heading out anywhere. Don’t trust any website to be updated! We have found the January through March months to be especially slow, but if you’re just looking for some quiet time it could be perfect! I’m sure we missed some stuff – especially since new things are popping up every few months. We’ve got a cute little bookstore in the works down the street, and I just noticed a sign for another upcoming bakery. 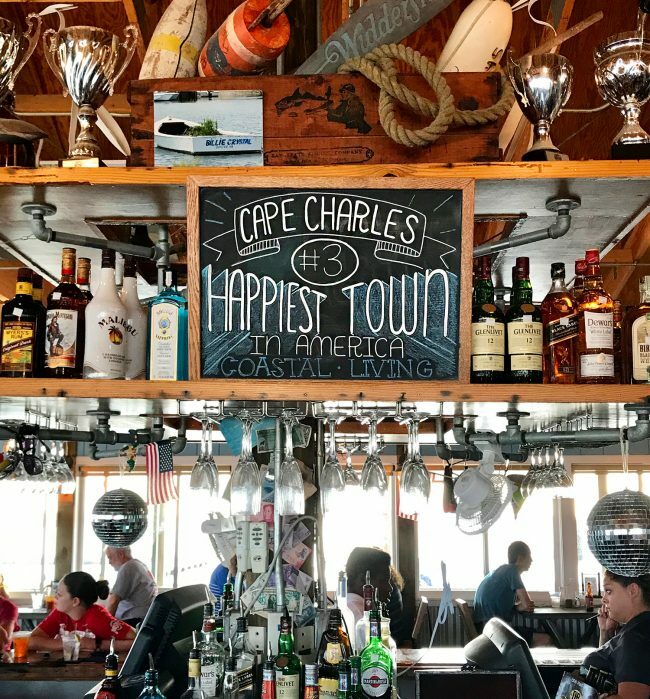 We hope you guys have a great time if you ever decide to slip through Cape Charles! And if you ever see us out and about while you’re visiting, please come say hello and tell us what we’re missing on this list! Ha!